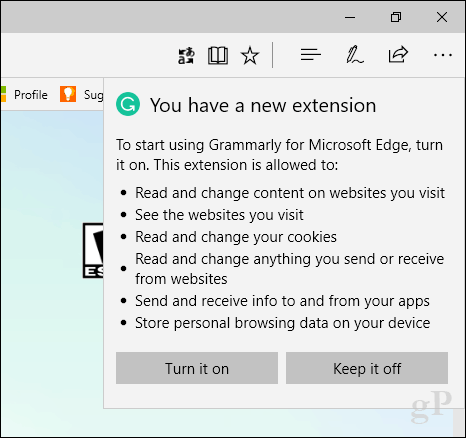 The Grammarly extension is now available for Microsoft Edge. Learn how to set it up and use it to check your documents, messages and posts for errors. Grammarly is now available for Microsoft Edge on the Windows Store. Microsoft added support for Edge Extensions in the Windows 10 Anniversary Update in 2016. Since then, the collection of available extensions have slowly been added to the new browser. It’s still not enough to match Firefox or Chrome, but enough to make you give Microsoft’s next generation web browser a second look. In this article, we take a look at how to find, download and set up Grammarly in Microsoft Edge. Currently, I use the free Grammarly add on in Microsoft Word and Outlook. There is a premium subscription, which checks for advanced grammatical issues however the free version does quite well. It helps me catch those common spelling and grammatical errors in my documents and groovyPost articles. 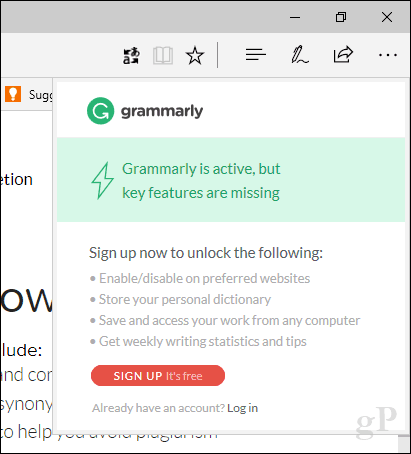 To install Grammarly for Microsoft Edge, first, head over to Grammarly and create a free account. Now, launch the Windows Store then search for Grammarly. Click Get to begin the download and installation. If you don’t see it in the search results, you can download it from the Microsoft Store web page then click Get the app. The download is about 8 MBs in size, so, it shouldn’t take too long. After the download is complete, click Launch. Grammarly will now appear as an extension in the More actions (…) menu. Click on it to sign into your account. Grammarly is supported on most sites using the browser extension and will instantly begin to assist you with the small details all of us forget from time-to-time. It’s great to finally see this handy extension now available on Microsoft Edge (a browser, which I must admit, I have not been using much). Fantastic! Just what I needed, although I installed it on Chrome. Thank you! Brilliriant! Nowe eye do’nuts haf two wurry abouts mi spellink. LOL! (P.s. Brilliant and many thanks, Andre)!